We all have habits we already do on a day to day basis. Habits are things that just happen without us thinking about them anymore. We brush our teeth, make our beds, maybe we exercise regularly, eat meals, or wake up and have a cup of coffee. We do these things now without thinking – it’s so good to have things we do without thinking! But a habit isn’t just a by-product of repetition. We can also develop and form new habits. 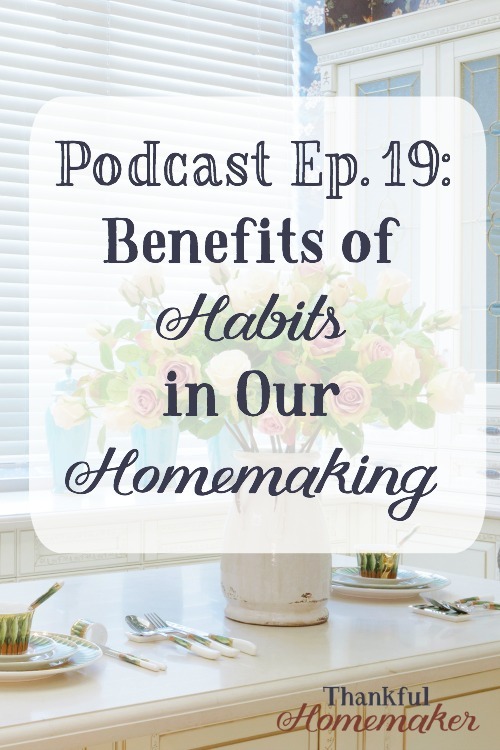 I can’t determine what habits you would like to develop in your homemaking, but I can encourage you to ponder and start small by doing just one. Maybe you don’t clean the dishes up after dinner immediately and leave them until morning. Would you like to change that habit and do clean up the night before? Your first step would be to identify where you need and want to change and the why. A reward can be a great incentive, and it doesn’t have to be external but can be the simple thought of how it makes you feel when you’ve accomplished the task set before you. It feels pretty good to not wake up to dirty dishes in the sink. God made our brains to be automation machines. Whenever we learn something new, there’s a little middle manager guy in our brain saying, “Hey! Can we automate this? How can we automate this? How about now? Can we automate it now? He’s just itching to make a habit out of everything we do because God made our brains to pursue efficiency. When we learn something new, a part of our brain called the cerebrum is on full alert. It’s working overtime to process the new information, understand patterns and eager the skill. But as we repeat it over and over, all that processing power moves to the area of our brain called the basal ganglia – this is where our more subconscious activities are managed: things such as breathing, blinking, walking and brushing our teeth. We don’t think about how to do these things they are automated. They’re habits. Habits allow our conscious brains to free up space by transferring the command center for that activity to the subconscious part of the brain, allowing us to then master new tasks while still performing old ones. When we have built good habits into our home keeping, they can become time savers for us and create more freedom into our days. When we work through the day efficiently, I can almost guarantee you that you will have more free time to do the things you enjoy doing. 1. Start your morning off with some specific tasks to get your day moving in a forward direction. 2. Always try to make your bed daily. 3. Keep up with the dishes after every meal. 4. Put things away where they belong when you’re done using them. 5. Never let clothes pile up. 6. Take the time to figure out a home filing system, so paperwork doesn’t clutter your counters. 7. Have a spot at your back door or wherever your family enters your home where family members can quickly remove shoes and coats with a place to put everything. 8. Clean up as you go along through your day. 9. Continually declutter as you are tidying areas. 10. Have some cleaning system in place. And my bonus tip – this one’s a favorite: Before you leave a room take two minutes to tidy it up.